According to the Q2 2015 Houzz Renovation Barometer of Houzz, many people are displaying greater confidence in hiring contractors and remodelers. Their report also reflects a steady optimism in the market growth, which is valuable not just for window companies, but also for homeowners. While the report subtly varies per state, industry conditions remain positive all the way to Q3. As home remodeling in St. Louis, MO, and other states continue to flourish, this only means more people are committing to home improvement. Along the lines of this news, Houzz predicts a positive review for the remainder of 2015. The only challenge that the industry faces these days is the shortage of skilled laborers, which is critical to growth. 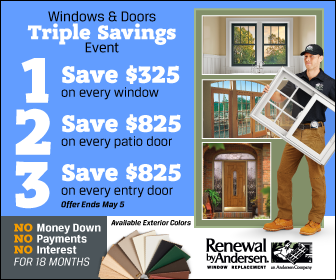 This report only continues to inspire top home improvement companies, such as Renewal by Andersen® of St. Louis. As one of the leading br ands in the window industry, we are dedicated to providing quality products and excellent workmanship. Our motivation lies in the satisfaction of every homeowner that we service. We believe that the only way to develop homes is through combining the innovations with first-rate installations. At Renewal by Andersen of St. Louis, we help homeowners make the most of their investment. Our window replacement process, for one, ensures reliable services. Our start-to-finish process assures you of quality installation and replacement. Moreover, our factory-trained professionals will make sure that the window is custom-fit to your home. You can trust not only our services, but also our products. Our window and door replacements are equipped with the latest technologies, particularly our Fibrex® composite frame. This gives the strength and stability of wood and the maintenance ease of vinyl. Our patented material makes our windows durable, sustainable, and easy to clean and maintain. We also created our Fibrex frames to be narrow to allow more space for glass. Another unique innovation in our windows is our exclusive High-Performance™ Low-E4® glass, which offers superior protection. Our special glass filters the sun’s harmful UV rays and to prevent damaging your furniture. The combination of Fibrex and High-Performance Low-E4 glass helps homeowners save on energy costs big time. With our replacement windows in St. Louis, you’ll enjoy a more beautiful and functional home. There’s no better time to invest in home improvement than today. For quality windows and doors, feel free to call us at (314) 332-2364. We will be happy to hear from you.